Why Did So Many Registered Voters Sit Out the 2016 Election? More often than not, Americans tend to talk about the presidential election in terms of halves: one half of the country voted for Republican nominee Donald Trump, and the other half voted for Democratic nominee Hillary Clinton. But that is simply not the case. Of the 227 million eligible voters in the United States, only about a quarter voted for Donald Trump, and a quarter for Hillary Clinton. A few percent voted for third-party candidates like Gary Johnson and Jill Stein, and the rest of the electorate just decided to sit back and watch it all unfold. 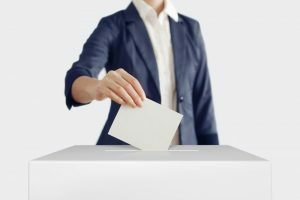 Research conducted by the Pew Research Center explains exactly why a large portion of the voting-eligible population opted out of voting in the 2016 general election. According to Pew, 25 percent of participants cited a “dislike of the candidates or campaign issues” as their main reason for not voting, a new high for American politics. In addition, 15 percent felt a disconnect or lack of interest in politics, claiming that their vote would not matter. Other reasons included being too busy or having a conflicting schedule (14 percent), having an illness or disability (12 percent), and being out of town or away from home (8 percent). 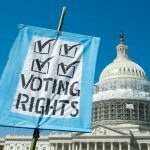 Another 11 percent gave miscellaneous reasons, one of which was that in some states, eligible voters may have been affected by restrictions put in place after the Supreme Court struck down key parts of the Voting Rights Act in 2013. Among African-American voters, 19 percent did not like the candidates or campaign issues, which is up from 3 percent in 2012. As for Hispanic registered voters who did not cast a ballot, one-quarter cited not liking the candidates or campaign issues as the reason for not voting, which rose from 9 percent in the 2012 presidential election. In comparison, higher shares of non-voting white and Asian-American registered voters provided the same reasoning. As a whole, Pew’s research suggests that the 2016 election stood out essentially because the racial and ethnic diversity of eligible voters did not rise for the first time in modern history. African-Americans, Hispanics, Asian-Americans, and other racial minorities “accounted for 27 percent of voters in 2016, a share essentially unchanged from 2012,” according to data from the Census Bureau. We, as a country, need to take into account of how crucial the 2016 election was, especially when in several states, candidate Trump won by a margin of fewer than 10,000 votes. This revelation sheds light on just how significant those missing votes might have been for either of the two major presidential candidates. It’s also a reminder of just how important an individual vote truly is in choosing the most suitable candidate to run our nation. Americans need to keep this in mind when voting in the upcoming midterms and in the 2020 presidential election.